eD@HoMe: A lovely cover from the Philippines! Hi, nothing much on this lazy Sunday afternoon... just to share with you this lovely cover from the Philippines that I received recently. The 2 se-tenant stamps on the right of the cover belong to the "Philippines Wild Ducks" series, issued on 6th August 2007. A complete souvenir sheet is shown below. The stamps feature Northern Pintail, Common Shelduck, Northern Shoveler & Greater Scaup respectively. 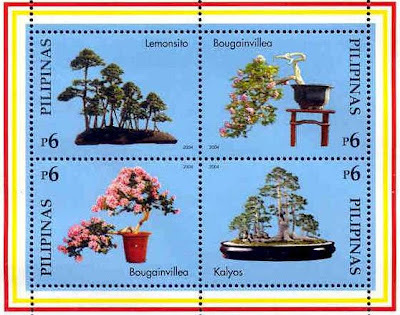 Next, on the cover is a stamp from the "Bonsai" series, issued on 27th July 2004. 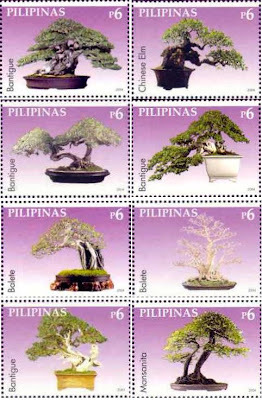 In addition, Philippines Post issued 2 other "Bonsai" set of stamps in 2004. Bonsai is a Japanese word that literally means 'a plant in a tray'. While its origins trace back to China, the Japanese having improvised it, this art is no longer exclusive to the Orientals but is practiced in almost all countries using species available in their localities. In the Philippines, it is believed that the art of Bonsai started during the Spanish times. Although its popularity among Filipinos is only recent. It is an amazing feat that Filipinos have caught up with this art in such a short span of time and yet have achieved a mastery of it recognised in almost all parts of the globe, thereby making Philippine Bonsai a source of pride and honor!